Back in 2012 a photo surfaced on social media. It showed a young man wading into a creek to retrieve a footy. The caption read along the lines of “if you kick it in, you get it yourself”. It was a reference to the one and only football belonging to that club. 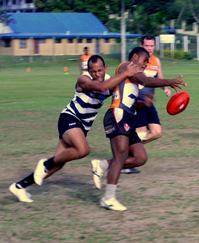 The club turned out to be the Raiwaqa Bulldogs, the youngest junior Australian Rules football team in Fiji. The photo cannot be found now, lost in the vacuum of social media feeds, but the club just won the 2014 AFL Fiji premiership. An incredible effort, given that less than two years ago their single football was their most valued possession. “RAIWAQA Bulldogs continued its fairy tale run to win its first AFL Fiji Cup at Albert Park in Suva yesterday. The Maciu Raida-skippered side defeated favourites Nausori Cats [128-59] in the showdown. The Bulldogs, which is a relatively new side in the competition, became the underdogs for the title after beating Suva City Swans in the semi-final. AFL Fiji national coach and board member Myke Leahy said the discipline from the Raiwaqa team won them the title. "The Bulldogs once again were very well structured, they had a strong leadership and played a disciplined game," Leahy said. "They played a tough, hard and physical game and kept the composure to deny the Cats from playing their normal game." But the Raiwaqa story leading up to the win is fascinating. The story isn’t quite the Cinderella story, although maybe the glass slipper is the premiership cup. It’s not even like the Pretty Woman story where Julia Roberts gets her Richard Gere. But it is “fairy tale” like in its story of coming from nowhere to achieve a dream. Back in 2012 the Raiwaqa Bulldogs started life as an Under 16 team. Raiwaqa, part of suburban Suva, began under the watchful and hopeful eye of Maciu and his wife. The 2014 season was the first for the team as a senior body. This decision came largely out of the opportunity to be part of the selection processes for a Fijian national team for the IC14 in Melbourne. The Under 16’s from 2012 could join other local and overseas talent to make a basis for a senior team. Come finals time, the team fought their way into the Grand Final beating the City Swans. From there, the rest is history as the youngest team in the league ran away to record a powerful 69 point win over the pre-match flag favourites the Nausori Cats. In doing so the Raiwaqa Bulldogs can also rightly claim to be not just the new kids on the block, but a new powerhouse emerging on the AFL Fiji scene. Maciu Raida is a justifiably proud man. He and his wife have overseen this rapid rise and he is aware just how much it means to have his family and community involved. But Maciu wants more. He is delighted with the addition of two Australians to the team (Fin Murphy and Preston Miskelly) and sees their addition, along with the six players from the club selected in the national squad for the International Cup as the perfect blending which worked together all season and came of age on grand final day. Whilst Maciu will now look forward to a repeat next season, and hopefully national success in Melbourne in August, his other aim for the club is being worked on. But for now Maciu, his wife, the club and the Raiwaqa community can simply enjoy one of the great Australian Rules football fairy tales. Julia Roberts did get Richard Gere. Cinderella did get the glass slipper to fit. And the Raiwaqa Bulldogs were able to grow from one wet football to a senior premiership team in just the blink of an eye. That’s a great footy story.